The last days of chrysanthemums at Muranaka Mums. This story originally appeared in our holiday issue on Dec. 9, 2014. To purchase a copy of the issue, stop by our office or call us at 213-629-2231. Shig and Mits Muranaka harvest flowers at the farm in Yorba Linda. They would work the farm together, as they raised four children. YORBA LINDA — A hot September day is even warmer in the hot houses of Muranaka Mums. 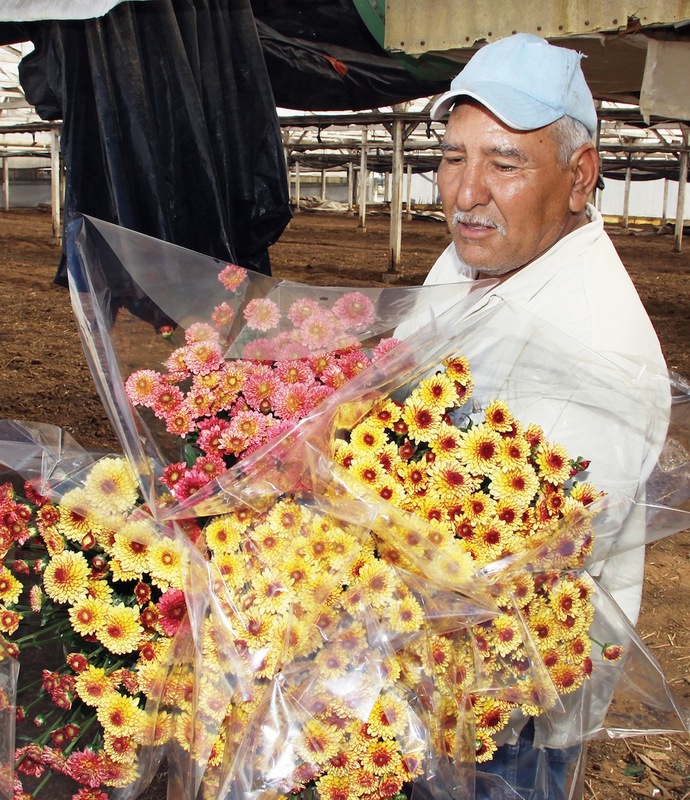 While a radio softly plays ranchera music, workers move from row to row, briskly picking what are the last chrysanthemums to be grown on the family farm. A final harvest and it is farewell to a way of life that has defined three generations of Muranakas. “This is the end,” Ron Muranaka says, wistfully. “Those mums there I’ll probably be taking in next week and that’ll be it,” he says, pointing to a cluster of bright yellow pom pom mums. This is not such an unusual story for Japanese Americans — so many of us have roots in farming — but in this case it happens to be my family. Visiting my aunt and uncle’s farm in Yorba Linda was something that I remember warmly. Uncle Shig’s beloved cats would roam the expansive driveway and every Oshogatsu we’d park the car next to the rows of greenhouses, as the extended family gathered in the single-story ranch house. On New Year’s Day, Auntie Mits would prepare an incredible spread of Oshogatsu foods: homemade manju and creampuffs, nishime, sashimi, kazunoko, and a variety of tempura. I’d dutifully pick out kuromame black beans representing each year of my life, the pile growing steadily larger. Uncle Shig would sit back in his easy chair, a pipe resting on an ashtray, smiling at his grandkids and nieces and nephews. It seemed it was always USC or Michigan playing in the Rose Bowl. The fact is that the farm was quiet this one day, a rare chance to enjoy the warmth of family and a good respite from the hard, hard work of farming. Ron Muranaka, Shig and Mits’ eldest son, is tall, with the lean, athletic look of a man who still competes in the 200-meter sprints at events such as the Nikkei Games. Born in the Rohwer internment camp, he is the third generation to grow chrysanthemums and has been doing so for over 40 years. “When I first started I was the youngest grower in the flower market and now I’m the second-oldest,” he laughs. Walking around the greenhouses, he points to some flowers that he says are unsellable due to thrips, an invasive insect that feeds on developing flowers, causing discoloration and deformities. The pest is just one of the challenges for today’s independent, domestic flower growers. “The flowers get unsellable. Since you look at flowers, you don’t eat flowers, the appearance has to be perfect,” he explained. About a week later at Kuragami Florist, Mary Onoue brings out a beautiful bouquet of white mums. 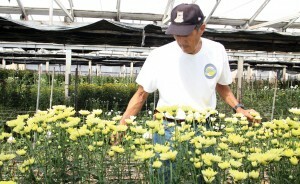 The Little Tokyo flower shop is one of the loyal customers who purchased Muranaka mums over the years. “The toughest thing is having to say goodbye to my customers. I’ve known some of them for the last 40 years,” Ron says. Otogoro Muranaka, my grandfather, was among the original group of Issei flower growers to form the Southern California Flower Market in downtown Los Angeles, but it was his wife, Asa, who was the driving force that pushed the family into chrysanthemums. A prewar photo shows Asa proudly posing surrounded by her mums. Asa Muranaka wields a cultivator in Clearwater, a community east of Compton. According to Tomio, it was his mother who was the driving force behind the family’s farm and their decision to grow chrysanthemums. Tomio Muranaka said he never knew why his mom preferred mums. In Japan, chrysanthemums are a symbol of longevity and the flower is the symbol of the imperial family. “These mums with the big heads, those were the ones my mom liked to grow. She always wanted to grow those,” Tomio explained. A sturdy woman, Asa was said to have been an ama diver in Wakayama, plunging into the cold waters off Shimosato to harvest seaweed. Her life in America was one of toil. In the early days, the family harvested oranges in the orchards of Orange along with a big group of Japanese workers. They would move to Montebello before the war, and later to Paramount immediately after returning from Rohwer in 1946. Tomio remembered that his father would drive to the flower market every day with bunches of flowers tied onto the running boards of the family’s Model T.
Otogoro was sickly and much of the hard work was left to his oldest son, Shig, who eventually had to drop out of school to manage the farm. 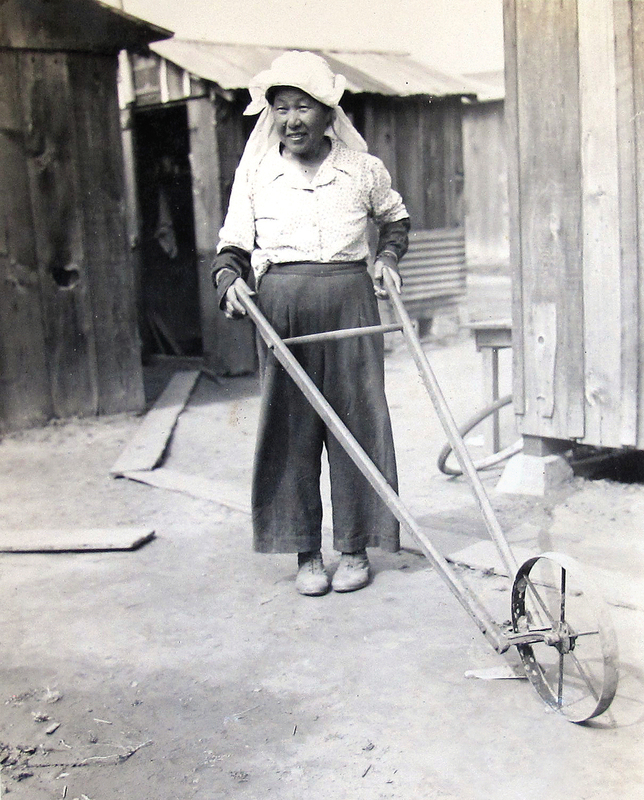 Shig was just 14 years old when he started to drive the flowers to market. At Montebello High School, Shig lettered in football. His son recalled that he played at the Coliseum against Glendale High School in the city championship. 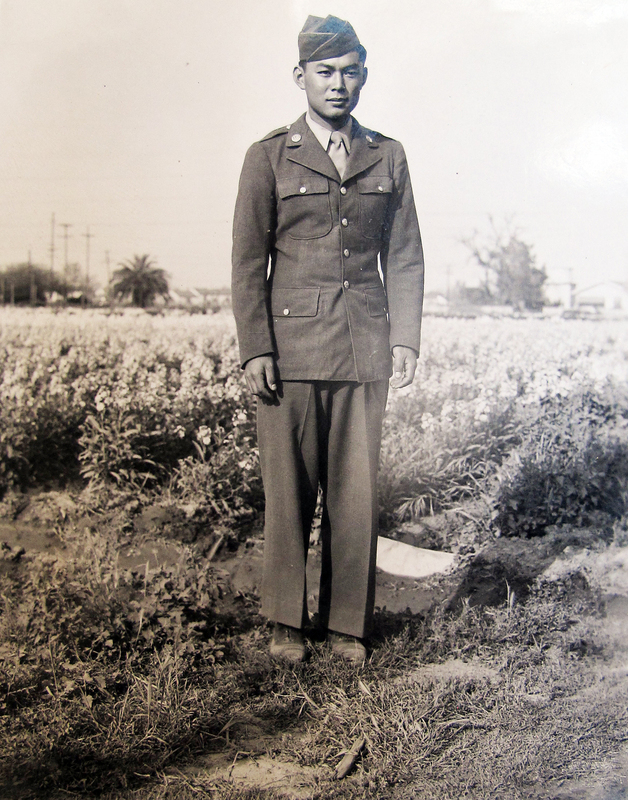 Tomio Muranaka poses in uniform amid the flowers at the family farm in Paramount in 1946. He had been given emergency leave from the Army when his father had taken ill.
“The team they played against had Frankie Albert, (a quarterback) who went on to the Football Hall of Fame,” Ron said with pride. 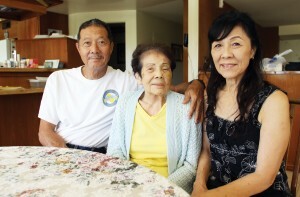 Shig met Mits Murayama and the couple married on April 13, 1942, as the family was relocated to Santa Anita Assembly Center, and eventually to Rohwer, Ark. After the war, the Muranakas settled in Paramount in a cluster of shacks with an outhouse, a furoba and several acres for farming,. Together the couple raised four children and expanded the farm, which moved several times, until finally settling to its current location in Yorba Linda in 1965. Teri Uyehara, Shig’s youngest sister, praised Mits — the strong, quiet center of the family. “Mits did as much as the guys did. Of course, she’d have to come in from the fields when the flowers were taken to the packing house. We would all go in and make the pillows out of newspapers and they’d package them up for Uncle Shig to take to market,” Teri said. She fondly recalled one of the highlights of working on the farm. In the early days on the farm, the family grew plants that were in season: ranunculas early in the year, asters in the summer. Tomio had strong memories of harvesting sweet peas, a delicate lavender flower, often used in wedding bouquets. 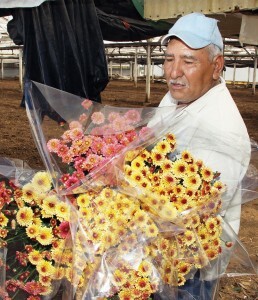 Asuncion Robles gathers bouquets of chrysanthemums. “One of the jobs I remember the most was picking sweet peas when it rained. Because sweet peas grow pretty tall and as you pick, everything’s wet and comes dripping down your sleeve,” Tomio said. Chrysanthemums are a flower of autumn. To grow them yearlong requires a bit of farming trickery, taught to Shig by Nob Kodaira, a farmer from Torrance. “Nob showed Shig how to use black cloth to fool the flowers into thinking it is fall. So the mum thinks, ‘Oh, it’s fall, I should be flowering,’” Ron said. The flowers grew in hot houses, covered in black cloth and later, plastic, simulating the long nights of autumn. Shig also invested in a 225 horsepower boiler that they used to sterilize the soil. Today much of the farming equipment purchased by Shig is still on the farm. “I would say we have the oldest equipment and trucks in the market,” said Ron. Shig passed away on March 15, 1999, leaving a large void in the family and on the farm. Since then, Ron has run the farm. His sister Carolyn Toya orders the plants and also sells flowers at the downtown market on Wall Street. Four days a week, the chrysanthemums are taken to market, which is busy in the morning with florists selecting blossoms for the day. Ron said he would leave around 1 a.m. and return to Yorba Linda by 11 a.m. The decision to close the farm was inevitable, something Mits has encouraged her son to do for years. Unfortunately, the toil and sweat of farming isn’t rewarded in today’s marketplace. “The price of flowers in the last 10 years may have gone up a buck or two,” Ron noted. “Speaking with some of the other growers, they’re thinking of other crops also, other than flowers. Because they’re so labor-intensive, with the price we get, it’s very difficult. Now the farm is quiet, the old machinery is still and the hot houses, once filled with flowers at all stages of development, are barren. The remaining workers, some of whom had been on the farm for decades, either retired or have been let go. Eventually the property will be sold. Ron has been recommending other flower growers to his clients. 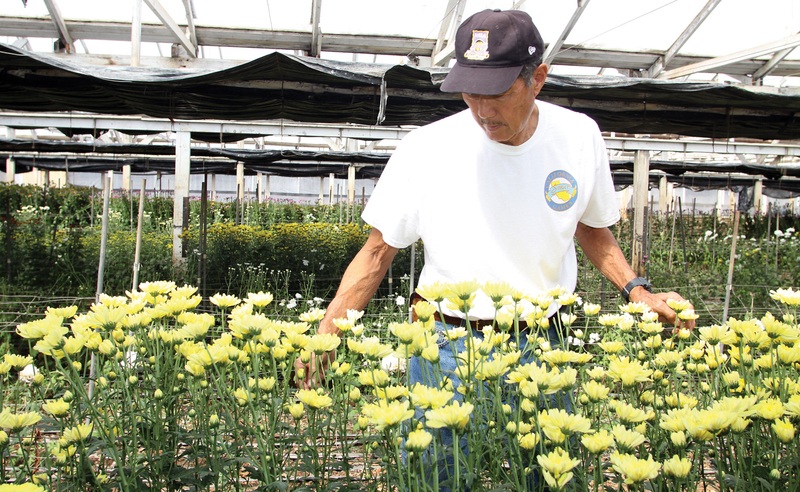 Kono and Sons in Carpinteria and West Floral of Oxnard are Japanese American flower growers who continue to grow chrysanthemums. 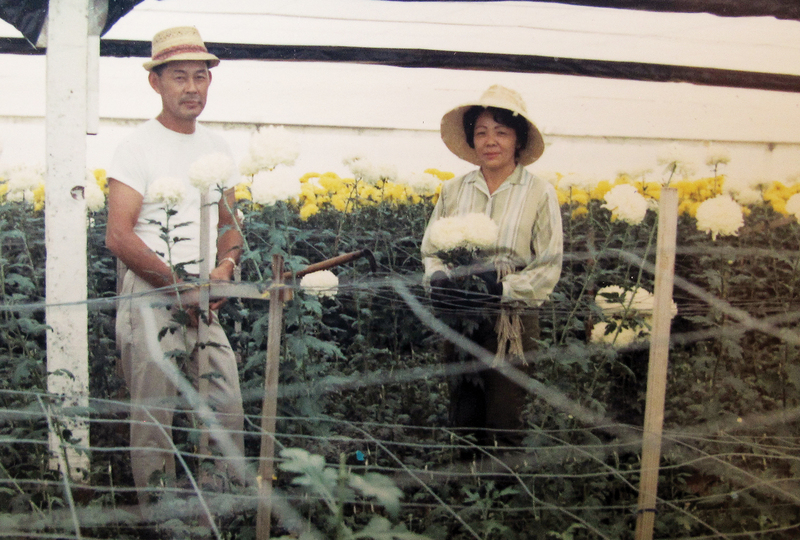 In Orange County, Muranaka Mums was the last Japanese American chrysanthemum farm. After more than 40 years, Ron said he is looking forward to retirement. “How can we not enjoy it? But it’s not something we planned for,” he said. How sad to hear of another family of growers who are going out of business because they can’t make a living growing flowers. We love what we do but, other countries are taking over with low wages, little regulation and help from their government When is our government going to wake up to what is taking place in our country.